This contest is now closed. The winner was selected on 2/11/19. The All Access Rewards (the "Service"), operated by Triton Loyalty, and WFLY-FM (together, Triton Loyalty and WFLY-FM are referred to as "we", "us" or "our") is provided to you ("you," "your" or "User") under the following terms and conditions, including any amendments thereto and any additional terms and conditions, rules or policies that may be applicable to particular offerings made in connection with the Service (collectively, the "Terms and Conditions"). We reserve the right to update or change these Terms and Conditions from time to time. Any such changes shall be reflected in an updated version of the Terms and Conditions posted on this site. By continuing to use the Service following the posting of any such change, you will be deemed to have agreed to the amended version of the Terms and Conditions. Any failure to comply with these Terms and Conditions by you may result in the termination of your account, and the forfeiture and relinquishment of all Points you have accrued in the Service. BY REGISTERING TO USE THE SERVICE, YOU AGREE TO BE BOUND BY THESE TERMS AND CONDITIONS, SO PLEASE READ THEM CAREFULLY. The Service is a program where registered users can accrue Points by engaging in certain activities and can redeem Points for certain offers ("Rewards"). Points accrued in the Service are non-transferable to other users or accounts and have no cash or monetary value. Some Rewards provided through the Service by way of auctions, sweepstakes, or trade-ins are promoted regionally or nationally to users of other rewards services. Rewards that are promoted and accessible only to users eligible to participate in this Service are noted as such by the display of the reward type 'L' on the page displaying the material terms for that sweepstake, auction or trade-in. Rewards promoted and accessible to users in multiple Services within this market or across multiple markets are noted as such by display of the reward type 'MM' on the page displaying the material terms for that sweepstake, auction or trade-in. Unless otherwise specified in connection with particular offerings, participation in the Service is open only to natural persons who are 13 years of age or older. Employees or agents of WFLY-FM, Triton Loyalty, and each of their respective affiliates, and immediate family members of or persons domiciled with any such persons are not eligible to participate. The Service and its benefits are offered at our discretion, and we have the right to modify or discontinue, temporarily or permanently, the Service, including the Points levels, in whole or in part for any reason, at our sole discretion. We may, among other things, withdraw, limit, modify or cancel any Reward; increase the Points required for any Reward; or modify or condition the transferability of Rewards or benefits. You agree that we will not be liable to you or any third-party for any modification or discontinuance of the Service, in whole or in part. In consideration of your use of the Service, you agree to provide true, accurate, current and complete information about yourself as prompted by the registration form and to maintain and promptly update your personal data to keep it true, accurate, current and complete. If you provide any information that is untrue, inaccurate, not current or incomplete, or if we or any of our service providers have reasonable grounds to suspect that such information is untrue, inaccurate, not current or incomplete, we have the right to suspend or terminate your account and to refuse any and all current or future use of the Service (or any portion thereof) by you. You may not register with a disposable email address. Only one member account per person and two member accounts per household. If you are 13 years of age or under you cannot post information about yourself on the website or complete the registration process. You can, among other things, review your accumulated Points, review the Terms and Conditions as amended from time to time, and review redemption options at rewards.fly92.com . You will receive a password and account designation upon completing the registration process. You agree to maintain the confidentiality of your password and account, and that you are fully responsible for all activities that occur under your password or account. You agree to immediately notify us of any unauthorized use of your password or account or any other breach of security, and to exit from your account at the end of each session. We will not be liable for any loss or damage arising from your failure to comply with these conditions. If for any reason your account is terminated by either you or us, all of your Points accrued will be forfeited. To earn Points, you must undertake an activity described in a Service-authorized promotion for earning Points, which may include, but is not limited to: streaming media on a designated media player, completing certain surveys, visiting certain retail locations or Internet Web sites, registering for a designated product or service or engaging in other online activities for which Points will be awarded in connection with the Service. You also will be rewarded a percentage of the total Points that your primary referrals earn on their use of the Service. We expressly reserve the right to change the rate at which referred Points are credited and to limit the amount of referred Points credited to your account each week to an overall maximum number of Points that may be less than the number of member referred Points that would have been credit based on the current percentage being paid. We also expressly reserve the right to establish additional means of accruing Points, to delete any or all of the means currently in effect, to exclude specific types of transactions from the accumulation of Points or to specify periods after which unused Points will be forfeited. Points can be accrued only for activity actually taken and completed by you or by your primary referrals and can be applied only to your account. You may earn Points from only one computer or network access point at any given time; simultaneous activity on multiple computers for one account will not be credited. Streaming activity is further limited to one stream at a given time. You may accrue Points simultaneously for non-streaming activity, provided it is in accordance with the conditions regarding network access Points and multiple computers. Points posted to your account for transactions that are subsequently voided will reduce the Points accrued in your account by the number of Points earned for the corresponding voided transaction. We will use reasonable efforts to allocate earned Points to each user's account. However, you are responsible for ensuring that your Points are properly credited. If you believe that Points have been earned but not credited, or in cases where we deem verification is required, we reserve the right to require proof of accrual, including, but not limited to, copies or receipts or similar documentation verifying any transactions claimed to have been performed. We must receive any claims of Points by you and proof of accrual within three months after the date such Points are claimed to be earned. Points will be maintained in your account until they are redeemed for a Reward or for 6 months or are forfeited whichever occurs first. Each month, all Points that are more than 6 months old will be deleted from your account. All decisions regarding point balances, rewards, and forfeitures, and the identity of the individual accessing an account, are within our sole discretion. You may redeem Points accrued in your account for Rewards, provided that your account is in good standing at the time of the redemption request. You may use your Points to submit Sweepstakes entries, each of which is subject to their own official rules available on the entry screen. You are required to be 18 years or older to bid in certain auctions, to be eligible for certain trade-ins or to submit certain Sweepstakes entries. Some Rewards provided through the Service by way of auctions, sweepstakes, or trade-ins are promoted regionally or nationally to users of other rewards services. Rewards that are promoted and accessible only to users eligible to participate in this Service are noted as such by the display of the reward type 'L' on the page displaying the material terms for that sweepstake, auction or trade-in. Rewards promoted and accessible regionally or nationally to users of this Service and other rewards services are noted as such by display of the reward type 'MM' on the page displaying the material terms for that sweepstake, auction or trade-in. In these cases, users of other rewards services in multiple cities will have the ability to participate in auctions, sweepstakes, and trade-ins available through the Service, which in turn may further limit the availability of the items offered to you through the Service. All active bids and sweepstakes entries will remain active and eligible for winning prize until the member is outbid or the sweepstakes entered closes. For these purposes, items will be deemed to be received on the date that you receive notice of an item being awarded in an auction or trade-in or a prize being awarded in a sweepstakes. Points earned in two or more different accounts may not be combined to redeem or bid for any Reward. Some Rewards have limited availability and all Rewards are subject to availability and other terms and conditions. Dependent upon availability, we may substitute Rewards of greater or equal value. In some cases, Rewards you select are sent to you directly by the merchant, who is solely responsible for the quality and performance of the goods supplied. Any rules of the merchants relating to returns and exchanges apply, but no Points will be re-credited to your account. You are responsible for taxes, if any, due on Points or Rewards. We reserve the right to modify or cancel any Reward offering at any time. Redeemed Rewards are not refundable, exchangeable, replaceable, redeemable, or transferable for cash, credit, other Rewards, or Points under any circumstances. To play some of the games offered through the Rewards Service (including, but not limited to, scratch and win games, blackjack-style games, and slots-style games), you must submit the required number of Points, at which time the Points will be deducted from your account. The minimum number of Points required for a game play will be determined separately for each game, but typically range from 25 to 5000 Points . Once submitted, your game play cannot be deleted, canceled or modified, except by the Operator. In the event of a dispute as to game play submitted by multiple individuals using the same computer, an entry will be deemed to have been submitted by the authorized registrant of the Rewards Service username and password from which the game play is made. The authorized registrant is deemed to be the natural person who is assigned a username and password, and all decisions regarding the identity of the authorized registrant shall be made by Operator in its sole discretion. You may also participate in games that require Points to play through an offline method. No Points are required for an offline play. To play a game offline, you must mail a 3" x 5" card to Triton Loyalty, 2125 Barrett Park Drive., Suite 112B, Kennesaw, GA 30144. Limit one card per outer postmarked envelope. The card must include the following information in legible, hand-printed or typed English: your full legal name, complete home postal address, home telephone number with area code, the user name and email address you entered when you registered for the Service, your age, gender, [insert name of station and/or Rewards Service], and the name of the game you wish to play. Each offline submission will entitle you to the number of Points needed to play the game identified in your offline submission once. Operator will deposit that number of Points into your account, and then you can play the game by submitting those Points in the manner described above. Operator is not responsible for any incomplete, late, lost, misappropriated, illegible, damaged, postage-due or misdirected mail-in entries or game play requests, or for failure to receive online entries or game play requests due to transmission failures or technical failures of any kind, including, without limitation, malfunctioning or unavailability of any network, hardware or software, whether originating with sender or Operator. Gaming, fraud or abuse relating to the accrual of Points or redemption of Rewards may result in forfeiture of accrued Points as well as the termination of your account. You are solely responsible for any fraudulent use of your Points that could occur due to the theft of or sharing of your password. The Service is provided to individual users who are natural persons for their own personal use. Machines, scripts or automated services may not be used to access any part of the Service, accumulate any Points, or participate in any other aspect of the Service. IT WILL BE CONSIDERED FRAUDULENT AND A VIOLATION OF THE TERMS AND CONDITIONS IF YOU ACCESS ANY OTHER REGISTERED USER'S ACCOUNT TO TAKE ANY ACTION, INCLUDING BUT NOT LIMITED TO ENTERING CODES, TRIVIA ANSWERS, COMPLETING SURVEYS, OR REDEEMING Points FOR PRIZES AND AWARDS, EVEN IF THE OTHER REGISTERED USER IS A FAMILY MEMBER. IT WILL BE CONSIDERED FRAUDULENT AND A VIOLATION OF THESE TERMS AND CONDITIONS FOR ANY MEMBER TO SHARE WITH OTHER MEMBERS CODE WORDS, TRIVIA ANSWERS OR OTHER INFORMATION THAT CAN BE REDEEMED FOR Points. IT IS CONSIDERED FRAUDULENT AND A VIOLATION OF THESE TERMS AND CONDITIONS FOR ANY MEMBER TO REDEEM CODE WORDS, TRIVIA ANSWERS, OR OTHER INFORMATION THAT CAN BE REDEEMED FOR Points THAT WAS RECEIVED FROM OTHER MEMBERS. ANY MEMBER SHARING IN THIS MANNER OR REDEEMING INFORMATION SHARED IN THIS MANNER WILL HAVE THEIR ACCOUNT DELETED AND WILL NOT BE AWARDED ANY REWARDS. IT WILL ALSO BE CONSIDERED FRAUDULENT AND A VIOLATION OF THESE TERMS AND CONDITIONS FOR ANY INDIVIDUAL OR COMPANY TO DIRECT, ENCOURAGE, OR ALLOW INDIVIDUALS TO USE A SINGLE ACCOUNT FOR THE PURPOSE OF ACCUMULATING Points FOR COMPANY USE. VIOLATIONS WILL BE PROSECUTED TO THE FULL EXTENT OF THE LAW. UNDER NO CIRCUMSTANCES SHALL WE BE LIABLE TO YOU OR ANY THIRD PARTY FOR ANY INDIRECT, INCIDENTAL, CONSEQUENTIAL, SPECIAL OR EXEMPLARY DAMAGES (EVEN IF WE HAVE BEEN ADVISED OF THE POSSIBILITY OF SUCH DAMAGES), ARISING FROM THE USE OF OR INABILITY TO USE THE SERVICE OR ANY OTHER PROVISION OF THESE TERMS AND CONDITIONS. BECAUSE SOME STATES DO NOT ALLOW THE EXCLUSION OR LIMITATION OF LIABILITY FOR CONSEQUENTIAL OR INCIDENTAL DAMAGES, IN SUCH STATES, OUR LIABILITY IS LIMITED TO THE EXTENT PERMITTED BY LAW. BY USING THE SERVICE YOU AGREE THAT OUR TOTAL LIABILITY FOR ANY ACTION, CLAIM OR JUDGMENT, REGARDLESS OF THE NATURE OF THE CLAIM OR THEORY OF LIABILITY, SHALL BE LIMITED TO YOUR ACTUAL OUT OF POCKET EXPENSES INCURRED IN CONNECTION WITH YOUR USE OF THE SERVICE, BUT IN NO EVENT ATTORNEY'S FEES. You accept all responsibility for, and hereby indemnify and hold us harmless from and against, any actions taken by any user authorized to use your account, including, but not limited to, accrual of Points, redemption of Points, and disclosure of passwords to third parties. We are not responsible for any incorrect or inaccurate information, whether caused by data entry errors by us, website users or by any of the equipment or programming associated with or utilized in the Sweepstakes or by any technical or human error which may occur in the set up or processing of the service. We assume no responsibility for any error, omission, interruption, deletion, defect, delay in operation or transmission, communications line failure, theft or destruction or unauthorized access to, or alteration of entries. We are not responsible for any problems or technical malfunction of any telephone network or lines, computer on-line-systems, servers or providers, computer equipment, software, failure of email or players on account of technical problems or traffic congestion on the Internet or at any website or combination thereof, including injury or damage to participants or to any person's computer or data related to or resulting from participating or downloading materials in this Web site. We are not responsible for cheating or fraud by any members. By using the Service, you release us, our subsidiaries, and affiliates from any and all liability regarding the redemption of Points, use of Rewards, or other participation in the Service. You understand and agree that in our sole discretion, and without prior notice, we may remove Points from your account as a penalty, terminate your access to the website or deactivate your membership account if we determine that you have violated our Terms and Conditions. These Terms and Conditions shall be governed by and construed in accordance with the laws of the State of Georgia, without giving effect to any conflicts or choice of laws rules (whether of Georgia or any other jurisdiction). The invalidity or unenforceability of any provisions of these Terms and Conditions shall not affect the validity or enforceability of any other provision. In the event that any provision of these Terms and Conditions is found to be invalid or unenforceable, these Terms and Conditions shall be construed in accordance with their terms as if the invalid or unenforceable provision was not contained therein. The Service and its components, including all trademarks, trade names and logos, are the property of Triton Loyalty and/or its licensors, which reserves all rights to such property. WFLY-FM and Triton Loyalty (collectively, 'us', 'we', 'Operators') have created this privacy statement in order to demonstrate our firm commitment to privacy. The following discloses our information gathering and dissemination practices for the All Access Rewards website ('Site'). We may also use your information for hiring, operational and business purposes, or to find out how we can improve our Site via surveys or online tracking mechanisms. We use aggregate Personal Information to help us to evaluate and modify existing services and features. We also use your Personal Information to develop new services and features that may be of interest to you. We will not sell, exchange, rent, lease or otherwise disclose your Personal Information or Sensitive Personal Information to other third party marketers or any such persons that are not associated with the Operators as Advertisers unless it is necessary to: 1) conform to regulatory and legal requirements or to comply with legal process; 2) to protect the safety and security of our users, employees, or property; 3) to defend the rights of the Site or the Operators; or 4) to enforce the Terms and Conditions of the Site. It is also necessary that we share your Personal Information and Sensitive Personal Information with our operational service providers, the specialists that provide internal support to the Operators operations and activities and/or for Site design, development, hosting and operations including maintenance, management, storage and/or fulfillment of our membership and e-mail clubs, various contests, sweepstakes, services, events and online stores. We use operational service providers to efficiently provide the full range of content, activities and membership services we bring to you and we request that our operational service providers also protect your privacy and not disclose your Personal Information or Sensitive Personal Information to third party marketers that are not associated with the Operators or website. Additionally, such providers are not to use your Personal Information for their own marketing or promotional purposes. We reserve the right to collect Personal Information using any new technology yet to be developed and to use such technology to provide new services and features to you, as well as for marketing and promotional purposes. Specific information regarding your choice to Opt-in or to Opt-out to such use, or for sharing your Personal Information with Advertisers, will be provided once the new technology, service, or feature is introduced. Our Site's registration form requires users to give us contact information (like their first and last name, mailing address, phone number, and email address) and demographic information (like their zip code, age, or gender). We use customer contact information from the registration form to send the user information about the rewards service, and to notify and ship prizes to the winners of auctions, sweepstakes, or contests as well as mail checks for cash earned on purchases made through the rewards service. The customer's contact information is also used to contact the visitor when necessary. We give users the option to remove their information from our database, to not receive future communications, or to no longer receive our service, by submitting your request to Member Support. Demographic and profile data is also collected at our site. We use this data to tailor the visitor's experience at our site, showing them content that we think they might be interested in, and displaying the content according to their preferences. This information is shared with advertisers and other third parties on an aggregate basis. Unless stated otherwise, we do not request contact information for a mobile phone, text messaging or any wireless device that includes a domain name address (such as ".net" or ".com") as part of the contact information. Federal law prohibits the sending of commercial email messages directly to a wireless device that uses a domain name, unless you have first given your affirmative consent. We may inadvertently collect a wireless device number that includes a domain name when you send us an inquiry or register for a contest or membership club. However, we will not knowingly use that contact information for sending commercial email. We reserve the right to respond to user inquiries or requests sent via a wireless device that uses a domain name as such messages are not deemed to be commercial email and therefore, are not regulated by Federal law. However, when "computer to phone" commercial emails are prohibited by law, we may reject your wireless device contact information when such information is submitted for certain Site features or services. We will attempt to notify you if we will need new contact information. For specific purposes (such as the purchase of goods and services) we may request a type of confidential personally identifiable information which shall be called "Sensitive Personal Information" and is defined as any individual's: (1) social security number; (2) driver's license number or state identification card number; or (3) account number, credit or debit card number, in combination with any required security code, access code or password that would permit access to an individual's financial account. This Sensitive Personal Information will only be used to implement the specific activity or event it was submitted for. We will not share your Sensitive Personal Information with Advertisers. However, more general Personal Information will be used to implement the specific activity or event and will also be used for the marketing of additional events, services and merchandising for this Site and the Operators. If you sign up for an email newsletter or alert, we will use your email address to deliver the newsletter or alert requested. To opt-out of any newsletter or alert, click the unsubscribe link at the bottom of the email or alert you received or go to Subscriptions and uncheck the box or boxes for the newsletters or alerts you wish to opt-out of. Advertising support allows us to offer, free of charge, many great activities and services to our users such as contests, sweepstakes and special events. Therefore, we may also use your Personal Information for the marketing of events, products or services of our generous Advertisers. There are two ways users may receive such information from Advertisers, either indirectly via newsletters, email or direct mail from the Site, or directly from the Advertiser. We may use one or both methods depending on the activity and the Advertiser. Our opt-in program allows you the opportunity to request to be contacted with additional information, to receive special offers and/or to receive materials from Advertisers. If you elect to opt-in to receive information, materials or special offers from these third parties, you give the Operators permission to transfer your personal information to our partners so they can fulfill your request. We will only share your information with those Advertisers or category of Advertisers you specifically opt-in to. Our third party partners have separate privacy and data collection practices; the Operators have no responsibility or liability for these independent policies. If you do not want your personal information shared with Advertisers, please select the option to not participate in our opt-in program. You have the option of completing online surveys as a part of the rewards service. Among other things, our surveys ask for demographic information (like income level). The information collected through these surveys is used to tailor our visitors' experience at our site and may be shared with advertisers and other third parties on an aggregate basis. Our Site also provides users the opportunity to opt-out of receiving communications from us and our Advertisers at the point where we request information about the visitor. We give users the option to remove their information from our database, to not receive future communications, or to no longer receive our service, by submitting your request to Member Support. We conduct the collection, management, maintenance and storage of website user information in a secure and commercially reasonable manner using acceptable industry standards of security technology and practices (such as electronic security systems and password protections) to protect against the loss, misuse or alteration of Personal Information. We also request that our operational service providers take such precautions. The Operator databases are accessible only by authorized personnel. However, please note that when users transmit Personal Information over an unsecured Internet connection, the Site is not responsible for the security of that information during the transmission stage as your email or registration could be copied or intercepted by unknown third parties. We use a secured connection only for the collection of Sensitive Personal Information, which is necessary for the purchase of goods or services, but we do not use a secured connection for other types of activities. Therefore, you understand, acknowledge, and agree that you transmit certain Personal Information over this Site at your own risk. Although persons of all ages may visit our Site and participate in activities that do not require the collection of Personal Information or Sensitive Personal Information, we do not knowingly or intentionally collect Personal Information or Sensitive Personal Information from children under the age of 13. Except for the limited circumstances listed below, we will automatically reject and delete the registration or entry of any person we believe in good faith to be underage. Any false or fraudulent registration or entry from a minor will be deemed to be ineligible and will disqualify the minor from the receipt of a prize, benefit, or other participation. Except to meet Federal Communications Commission ("FCC"), or other regulatory and legal purposes, we will not use, store, or disclose any child's Personal Information to a third party without prior parental consent. This Site may have contests and prizes that could appeal to children. However, we do not knowingly or intentionally collect personal Information from children. If we unintentionally receive Personal Information from children under the age of 13 in relation to this activity, we will comply with the Children's Online Privacy Protection Act of 1998 ("COPPA") and reject and destroy such correspondence upon knowledge of such collection, except for the limited circumstances above. For more information about COPPA, please see the Federal Trade Commission's website: www.ftc.gov. If you are a California resident and request information about how to exercise your third party disclosure choices you must send a request to the following address with a preference on how our response to your request should be sent (email or postal mail). You may contact us in two ways. Send email to Privacy Administrator at the email address listed in the Contact Us section below. Alternatively, you may contact the Operators at the physical address listed below in the Contact Us section of this privacy statement. For requests sent via email, you must put the statement "Your California Privacy Rights" in the subject field of your email. All requests sent via postal mail must be labeled "Your California Privacy Rights" on the envelope or post card and clearly stated on the actual request. For all requests, please include your name, street address, city, state, and zip code. (Your street address is optional if you wish to receive a response to your request via email. Please include your zip code for our own recordkeeping.) We will not accept requests via the telephone or by facsimile. We are not responsible for notices that are not labeled or sent properly, or do not have complete information. You can choose to have your computer warn you each time a cookie or image tag is being sent, or efficient and enjoyable - like the features mentioned above - and some of our other services will not function properly. This Site often provides links to third party websites that could be of interest to our users, including the websites of our Advertisers. The Operators do not own or control these websites and therefore, are not responsible for the content, business practices, nor operations of such websites. Third party websites linked on this Site may have different privacy policies and business practices than we do. The presence of a link to a third party website does not constitute or imply our endorsement, recommendation, or sponsorship of the third party content, goods, or services available through, or contained on, the Site. By use of this Site, you have agreed that you will use the hyperlinks to third party sites at your own risk. We give users the option to change and modify information previously provided, by visiting the "My Account" section of the website or by submitting your request to Member Support. For communications related to Your California Privacy Rights, contact us at the address below. For requests sent via email, you must put the statement "Your California Privacy Rights" in the subject field of your email. If you have any other questions about this privacy statement, the practices of this Site, or your dealings with this Site, you contact us at the address below. For requests sent via email, you must put the statement "Privacy" in the subject field of your email. This sweepstakes will begin on 1/15/2019 3:00 AM ET and all entries must be received by 2/11/2019 3:00 AM ET. You currently have 0 entries. NO PURCHASE IS NECESSARY TO ENTER OR TO WIN. A PURCHASE OR PAYMENT WILL NOT INCREASE YOUR ODDS OF WINNING. ALL FEDERAL, STATE AND LOCAL LAWS, RULES AND REGULATIONS APPLY. VOID WHERE PROHIBITED BY LAW. SWEEPSTAKE PERIOD. This sweepstake (the "Sweepstake") is sponsored by Enticent, LLC d/b/a Triton Digital located at 2125 Barrett Park Drive., Suite 112B, Kennesaw, GA 30144 (the "Sponsor") and runs between 01/15/2019 at 3:00 AM ET ("Eastern Time") and 02/11/2019 at 3:00 AM ET (the "Sweepstake Period"). The clock used by Sponsor to compute the Entries (as such term is defined below) will be the official clock to determine the date and time of receipt of an Entry. For the purposes of this Sweepstake, the "Sweepstake Group" is composed of the Sponsor and Pamal Broadcasting (the "Publisher") together with their respective affiliate, related parent, sister and subsidiary companies, retailers, franchisees, and any other corporation, partnership, so proprietorship or other legal entity directly involved in the Sweepstakes and each of their respective officers, directors, employees, agents, dealers and other representatives. 2.ELIGIBILITY.The Sweepstake is open to all legal residents of the fifty (50) United States and the District of Columbia who are at least eighteen (18) years of age at the time of entry. Each entrant must have a valid mailing address in the United States (a P.O. box will not suffice). Excluded from the eligibility are the members of the Sweepstake Group as well as any member of their immediate family (defined as parents, siblings and spouses, and children, regardless of where they reside) and those with whom they are domiciled (whether or not related). Online Entry: LIMIT: one (1) online entry per person per day during the Sweepstake Period.To obtain one (1) online entry into the Sweepstake you must (i) have a registered member account on the Publisher's website. If you do not already have one you can create one free of charge; and (ii) visit http://rewards.fly92.com/Contest/3JYINV (the "Sweepstake Website") during the Sweepstake Period and complete the entry form with your full name, email address, age and ZIP code and, if required, submit the required number of points, which number of points will then be deducted from your account. An entry will not be valid unless all of the required fields of the online entry form are completed and the information is valid. Mail-in Entry:You may also participate in the Sweepstake through a mail-in entry. 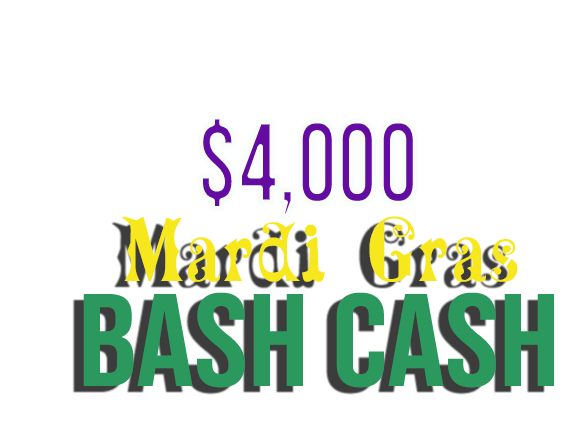 No Points are required for a mail-in entryLIMIT: one (1) mail-in entry per person during the Sweepstake Period.In order to participate in the Sweepstake by mail, you must mail a 3" x 5" card to Triton Digital, $4,000 Mardi Gras Bash Cash Sweepstakes, 2125 Barrett Park Drive., Suite 112B, Kennesaw, GA 30144, which must include the following information in legible, hand-printed or typed English: (i) your full legal name; (ii) complete mailing address; (iii) home telephone number with area code; (iv) email address; (v) your age; (vi) your gender; and (vii) the name and Item ID number of the Sweepstakes (3JYINV) (each a "Mail-in Card", and collectively the "Mail-in Cards"). All Mail-in Cards must be received on or before the end of the Sweepstake Period, except that if the end of the Sweepstake period falls on a Saturday, Sunday or statutory holiday in the United States, your Mail-in Card must be received by the immediately preceding business day. If you are concerned about your Mail-in Card being received by the end of the Sweepstake Period, during the three (3) business days immediately preceding the end of the Sweepstake Period you may fax in a photocopy of your Mail-in Card to 770-919-2120. The facsimile must contain a photocopy of the Mail-in Card with the full information listed above and must be received by the end of the Sweepstake Period. After faxing a copy of your Mail-in Card, you must still mail in your original Mail-in Card for your facsimile entry to be valid. Your original Mail-in Card must be postmarked prior to the end of the Sweepstake Period and must be received no later than four (4) days following the end of the Sweepstake Period. If your original Mail-in Card is not received by mail within the requested period of time, your facsimile entry will be void and you will forfeit any and all interest in the prize(s). Upon receipt and verification by the Sponsor of your Mail-in Card, you will automatically receive one (1) entry in the Sweepstake. The Mail-in Cards will be considered "Entries" if they comply with the drafting requirements and are received within the requested timeframe. Sponsor is not responsible for any incomplete, late, lost, misappropriated, illegible, damaged, postage-due or misdirected mail-in entries. Once the Sponsor receives your Mail-in Entry, a registered member account on the Publisher's site will be created. By participating in the Mail-in Entry, you authorize the Sponsor to (i) create a member account on the Publisher's site using the information provided on your Mail-in Card; and (ii) you agree to receive email newsletters, promotions and other similar communications from the Sponsor and/or the Publisher. You can opt-out of receiving this communication at any time by clicking the unsubscribe link in the communication. The online entries and the mail entries are each an "Entry", and collectively the "Entries". By submitting your Entry, you are indicating that you have read and accepted these Official Sweepstake Rules. The entrant must submit each Entry personally. Subsequent Mail-In Entries from the same person or member account will not be accepted. Online entries are limited to one per person per day during the Sweepstake Period. Photocopied, mechanically reproduced, forged or altered Entries are void. All Entries must be received during the Sweepstake Period. The Sweepstake Group is not responsible for entries which it does not receive due to technological/server error, or for lost, late, undelivered, invalid, unintelligible, incomplete, misdirected, illegible, or damaged Entries, which will be disqualified. Entries become the exclusive property of Sponsor and will not be returned or acknowledged. Multiple entrants are not permitted to share the same email address. Any attempt by any entrant to submit more than the permitted number of Entries for each method of entering the Sweepstake by using multiple/different email addresses, member accounts, identities, registrations and logins, or any other methods will void that entrant's Entries and that entrant may be disqualified within Sponsor's sole discretion. Use of any automated system to participate is prohibited and will result in disqualification and all associated Entries will be void. In the event of a dispute as to the identity of any person who submitted an Entry, the authorized account holder of the email address or the member account used to enter will be deemed to be the entrant and must comply with these Official Sweepstake Rules. The "authorized account holder" is the natural person assigned an email address or member account by an Internet access provider, online service provider or other organization responsible for assigning email addresses or member accounts for the domain associated with the submitted address. Potential winners may be required to show proof of being the authorized account holder. 4.PRIZE. There is one (1) grand prize available to be won, consisting of a cash award in the amount of four thousand US Dollars (US$4,000) (the "Prizes"). Prize is non-transferable. Sponsor reserves the right to substitute the Prize for one of equal or greater value in Sponsor's sole discretion. No more than the stated number or value of Prizes will be awarded. All taxes, fees, and surcharges on prizes are the sole responsibility of the winner. Winner may be required to complete a W-9 taxpayer identification form. SELECTION. Limit: One (1) Prize during the Sweepstake Period. On 2/11/2019 at Sponsor's offices located at 2125 Barrett Park Drive., Suite 112B, Kennesaw, GA 30144, at approximately 08:00 AM ET, one (1) Entry will be selected at random from all eligible Entries received during the Sweepstake Period as eligible to win the Prize. NOTIFICATION AND PRIZE DELIVERY. The selected entrant will be notified by email and/or by telephone, using information provided at the time of entry, within approximately five (5) business days of the draw date. If a potential winner fails to respond within the three (3) day period following attempted notification or if the notification is consistently returned as undeliverable or fails to reach the potential winner for any reason (including, without limitation "soft" and "hard" email bounces) or if the potential winner fails to respond for any reason to the notification as directed, the potential winner will be disqualified and, time permitting, an alternate winner will be selected, who will be subject to disqualification in the same manner. Sponsor's agent or representative will arrange for delivery of the Prize by mail to the mailing address provided by the winner. Sponsor is not responsible for any change in entrant's email and mailing address. Sponsor is not responsible for any costs incurred by a winner to collect their prize. Sponsor will not ship any prizes to an address outside the United States. Prior to being confirmed as the winner, the selected entrant may be required to sign and return within ten (10) business days of notification the Sponsor's declaration and release form, which (among other things): (i) confirms compliance with these Official Sweepstake Rules, (ii) acknowledges acceptance of the Prize as awarded; and (iii) releases the Sweepstake Group from any and all liability in connection with the Sweepstake. Failure to sign and return the affidavit and release within such period or to comply with any term or condition of these Official Sweepstake Rules may result in disqualification and forfeiture of any interest in the Prize and the Sponsor reserves the right, in its sole and absolute discretion, to randomly select an alternate eligible entrant from among the remaining eligible entries (in which case the foregoing provisions of this section shall apply to such new selected entrant). 7.ODDS.Odds of winning depend on the total number of eligible Entries received for each drawing. Sweepstakes may be offered in multiple presentations conducted regionally or nationally in multiple cities and through other websites, and odds of winning may depend on number of eligible entries received through such other presentations. PERSONAL INFORMATION.Sponsor and its authorized agents will collect, use, and disclose the personal information you provide when you enter the Sweepstake for the purposes of administering the Sweepstake and prize fulfillment. By entering this Sweepstake, you consent to such collection, use, and disclosure of your personal information. You may also be offered the opportunity to receive additional communications from Sponsor about its products, and upcoming sweepstakes and promotions. By accepting a prize, the winner agrees to the Sweepstake Group's use of his/her name, city/state of residence, picture, biographical information, statements, voice and likeness in any advertising and publicity Sponsor may conduct relating to the Sweepstake in any media or format, whether now known or hereafter developed, including but not limited to the World Wide Web, at any time or times in perpetuity, without further compensation or notice. 9.RIGHT TO VOID / MODIFY / SUSPEND.Sponsor reserves the right to terminate, suspend or modify this Sweepstake, or these Official Sweepstake Rules, in whole or in part, at any time and without notice or obligation if, in Sponsor's sole opinion, any factor interferes with its proper conduct as contemplated by these Official Sweepstake Rules. Without limiting the generality of the foregoing, if the Sweepstake, or any part thereof, is not capable of running as planned for any reason, including but not limited to infection by computer virus, bugs, tampering, unauthorized intervention, fraud, programming errors, or technical failures, which, in the sole opinion of Sponsor, corrupt or affect the administration, security, fairness, integrity or proper conduct of this Sweepstake, Sponsor may, in its sole discretion, void any suspect Entries and: (a) terminate the Sweepstake, or any portion thereof; (b) modify or suspend the Sweepstake, or any portion thereof, to address the impairment and then resume the Sweepstake, or relevant portion, in a manner that best conforms to the spirit of these Official Sweepstake Rules; and/or (c) award the Prize from among the eligible, non-suspect Entries received up to the time of the impairment in accordance with the winner selection criteria discussed above. LIMITATION OF LIABILITY AND RELEASES.By participating in this Sweepstake, entrants agree to release and hold harmless all of the members of the Sweepstake Group (collectively, the "Releasees") from and against any and all claims, injury or damage (including without limitation direct, indirect, incidental, consequential or punitive damages), to persons or property, arising out of or relating to (a) entry or participation in this Sweepstake, including access to and use of the Sweepstake website, (b) any claims based on personality or privacy rights, defamation or prize delivery, or (c) the possession, use, misuse, or redemption of a prize (including any travel or activity related thereto), or the merchandise in which it is redeemed, if applicable. Some jurisdictions do not allow the exclusion or limitation of incidental or consequential damages, therefore such exclusions may not apply to you. Without limiting the foregoing, the Releasees and any of Sponsor's other agencies, suppliers or contractors, shall not be responsible for: (a) any incomplete or inaccurate information that is caused by Sweepstake Website users, or by any of the equipment or programming associated with or utilized in the Sweepstake, or by any technical or human error which may occur in the processing of submissions in the Sweepstake; (b) lost, interrupted, or unavailable network, server, service provider, on-line systems, telephone networks or telephone lines, or any other connections; (c) the theft, destruction, loss or unauthorized access to, or alteration of, Entries; (d) any problems with, or malfunctions or failures of, telephone networks or lines, computers or computer on-line systems, servers or providers, computer equipment, software, viruses or bugs; (e) garbled transmissions or miscommunications; (f) failure of any email to be received by or from any contest judging organization or Sponsor for any reason, including but not limited to traffic congestion on the Internet or at any website or combination thereof or technical incompatibility; (g) damage to a user's computer equipment (software or hardware) occasioned by participation or downloading of materials related to this Sweepstake; (h) printing, distribution, programming or production errors, and any other errors or malfunctions of any kind, whether human, mechanical, electronic or otherwise; or (i) technical, pictorial, typographical or editorial errors or omissions contained herein. 11.GENERAL CONDITIONS.Participation in this Sweepstake constitutes agreement by entrant to these Official Sweepstake Rules. Winning a prize is contingent on fulfilling all the requirements set forth herein. All Entries and prize claims are subject to verification. Proof of Entry submission does not constitute proof of receipt. Entrants agree to abide by these Official Sweepstake Rules. Sweepstake is subject to all applicable federal, state, local and municipal laws. Void where prohibited. Sponsor reserves the right to correct any typographical, printing, computer programming or operator errors. Sponsor's failure to enforce any term of these Official Sweepstake Rules shall not constitute a waiver of that provision. The invalidity or unenforceability of any provision of these Official Sweepstake Rules shall not affect the validity or enforceability of any other provision. If any provision of the Official Sweepstake Rules is determined to be invalid or otherwise unenforceable, then the Official Sweepstake Rules shall be construed in accordance with their terms as if the invalid or unenforceable provision was not contained therein. Should a winner make any false statement(s) in any document referenced above, the winner will be required to promptly return to Sponsor his/her prize, or the cash value thereof. Sponsor reserves the right to disqualify any entrant where it is suspected or evident that tampering with the Sweepstake operation, or a violation of these Official Sweepstake Rules, has occurred. WARNING: ANY ATTEMPT BY AN ENTRANT OR ANY OTHER INDIVIDUAL TO DELIBERATELY DAMAGE ANY WEBSITE ASSOCIATED WITH THIS Sweepstake OR UNDERMINE THE LEGITIMATE OPERATION OF THE Sweepstake IS A VIOLATION OF CRIMINAL AND CIVIL LAWS, AND SPONSOR RESERVES THE RIGHT TO PROSECUTE AND SEEK DAMAGES TO THE FULLEST EXTENT PERMITTED BY LAW. Any questions, comments or complaints regarding the Sweepstake must be directed solely to Sponsor. All trademarks are the property of their respective owners. 12.Sweepstake Disputes. Any and all disputes which cannot be resolved between the parties, and any causes of action arising out of or connected to the Sweepstake, shall be resolved individually, without resort to any form of class action. Entrants consent to the exclusive jurisdiction of the courts located in Cobb County, Georgia, and agree that all matters pertaining to these Official Sweepstake Rules and disputes arising hereunder shall be governed by and interpreted in accordance with the laws of the State of Georgia, without regard to any conflicts or choice of law rules or provisions (whether of Georgia or any other jurisdiction). Further, in any such dispute, under no circumstances will participant be permitted to obtain awards for, and participant hereby waives all rights to claim, punitive, incidental or consequential damages, including attorneys' fees, other than participant's actual out-of-pocket expenses (i.e., his or her costs associated with entering this Sweepstake), and participant further waives all rights to have damages multiplied or increased. The invalidity or unenforceability of any provision of these Official Sweepstake Rules shall not affect the validity or enforceability of any other provision. In the event that any provision of these Official Sweepstake Rules is found to be invalid or unenforceable, these Official Sweepstake Rules shall be construed in accordance with their terms as if the invalid or unenforceable provision was not contained therein. Winner's List: To obtain a copy of the winner's list, available thirty (30) days following the end of the Sweepstake Period, please send a self-addressed, stamped envelope to: Triton Digital Sweepstakes Winner's List, 2125 Barrett Park Drive., Suite 112B, Kennesaw, GA 30144. Please indicate which Sweepstakes winner's list you would like to receive.